We are waiting for chicken and waffles at IHOP like hopeful freshmen waiting to get into the Fly. All I want is the promise of a good time, as well as chicken tenders that are slightly overbreaded and small, but still satisfying. 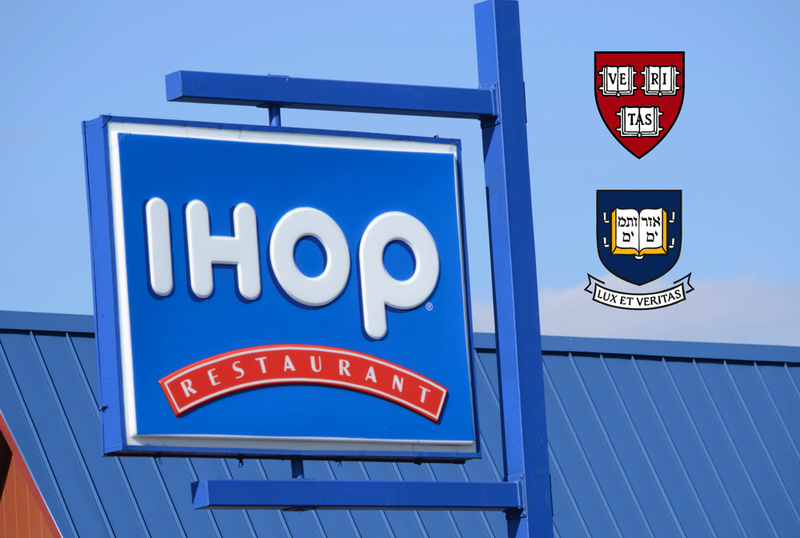 And I want them served with unlimited coffee that will arrive late and mustard sauce that I will neglect, all in the company of the loose crew I’ve assembled on the walk from the Science Center plaza, where the official First Year tailgate is, to the IHOP near the Kennedy School on Eliot Street. On Massachusetts Avenue, a man wearing a wool Hillflint “H” sweater shoos a group of confused Yalies, mostly female, away from the unmarked entrance of the Porcellian. “Sorry,” he says, “this is a club.” My friend recognizes him and waves casually. Instead of waving back, he kisses two fingers and sends the kiss off to her, as if he’s Harry Styles and she a shrieking 13-year-old camping out outside his mansion just to catch a glimpse. None of this matters, though, because IHOP is open to everyone—as long as they’re content with looking at corny advertisements for Grinch-themed pancakes as they wait 10 minutes for a table. The snacks are probably cheaper, anyway, and there are special prices for those (parents, faculty, alums) aged 55-plus. A server eventually waves us over with thick laminated menus that promote too many breakfast combos as “ultimate” to our table. “Right this way,” he directs. None of my friends are going to The Game, which is evidenced by the fact that we’re at IHOP deliberating whether our crêpes should come with lingonberry, and not on a shuttle into Boston. I can cycle through the obvious explanations of why I didn’t want to go: I went to a large public high school in North Texas, so I’ve already had my fill of grand stadiums and public sport. Besides, I’m not particularly in the mood to bus with drunk undergraduates all the way to Fenway, especially when here there’s promise of strawberry banana French toast. But the real reason is that I’m a little exhausted by group revelry. There’s a certain fatigue to being at Harvard for four years, which I have a difficult time separating from the general disillusionment of growing up. Harvard-Yale is the one time of year when undergraduates get relief from the pressures of individuality: when we dress up in our Harvard “H” sweaters and scream wildly in the stands, we’re not representatives of ourselves but of an idea, a broader identity. Now that I’m in my final year, that wish for temporary abandonment has exposed itself as a futile attempt to deny that the world beyond graduation is scary. All of the industries I love seem to be dying. In cover letters, I have a hard time remembering what makes me unique. The time I have left to shelter behind the banner of “Harvard student” is dwindling. There’s nothing innate that binds Harvard students together—just the fact that we occupy the same space, submitted our Common App to the same school near Boston, and make the commonality of our admission here salient, at least for one day. You could say the same about the patrons of this IHOP, that nothing holds us here but imagined community, and I’m more inclined to believe in the ideology of free refills than in the Protestant work ethic as a unifying force. In this middle-class establishment, which peddles diabetes in Rooty Tooty Fresh N’ Fruity Pancakes®, my only relevant identity is “customer”—not Rhodes finalist, New York Times intern, or friend of the Fox. No one cares that I’m writing a thesis about the Frankfurt School. The humble pleasure that I derive from heaped-on hash browns reminds me of the small satisfactions I’ve devalued in a stubborn quest to be extraordinary. Maybe if I thought more about chicken tenders, I’d be happier. And mine are magnificent: crispy and overbreaded and expectedly small. As I bite into them and then burn my tongue on hot coffee, I remind myself that ambition is a choice. Earlier in the weekend, a friend and I discussed the possibility of attending service at a nearby Quaker meetinghouse and finding God, searching for higher meaning outside our own anxious achievements. The more I grow older, the more these opportunities seem to be closing. The night before Harvard-Yale, I ran into a former boyfriend, whose voice sounded unnaturally loud as he forced out a surprised “hello.” Seeing him—and checking self-protectively for texts from someone in the wide, uneven terrain between acquaintance and “partner”—I remembered how long it’s been since I’ve believed in uncorrupted love. Internally, I’m worried that when I’m done with climbing ladders, I’ll no longer know what I’m really reaching for, in the absence of something greater. But at least at IHOP, I just have to eat my chicken tenders. Catherine Zhang ’19 is one of this year’s Berta Greenwald Ledecky Undergraduate Fellows. Follow her on Twitter @CatZhang1. A FOP group looks out over a lake in New Hampshire, August 2015.